In mid-November 2016 the future of American “Free Enterprise” looked rosy through the tinted lens of the <one percent. Recovery from the Great Recession that had set a new record length on Obama’s watch showed no signs of slowing down. The wealthiest ruling class in history had great expectations of becoming richer yet with one of their own heading to the White House. He promised–among other things–big tax-cuts, wholesale deregulation, and unprecedented privatization of public assets. The boss class would have been more than satisfied with Clinton; they were positively ecstatic over Trump, backed by a Republican Congress. But instead of focusing on taking care of business on these issues that matter most to the elite the first billionaire to be ensconced, at least weekdays, at 1600 Pennsylvania Ave NW, was obsessed with the “other things”–producing one “crisis” after another. While Merriam-Webster has multiple definitions of crisis few of the kerfuffles emanating from the Oval Office seem to fit. Some of the alarms last only a few hours. Other bold moves are soon reversed with no acknowledgment much less explanation. Moron is an archaic term once used to define a group below purported average intelligence. Both more appropriate and disturbing is a cogent diagnosis of psychopath derived from mean-spirited, erratic, lying, boasting, and sometimes plain foolish stunts, of the sole proprietor of the nuclear launch codes. The psychotic behavior of President 45 sparked a “resistance” demonstrated in the streets by women, people of color, defenders of immigrants, and most recently high school students protesting rampant gun violence. The opposition ruling class party mainly just says “no” to outrages with little need to offer alternatives to ongoing “crises.” Trump sets the crisis-driven agenda. Of course, defensive battles around important issues are necessary and often at least partially successful. But holding the line on multiple “crises” leaves us vulnerable to an overarching genuine crisis that threatens the very survival of human civilization. On our companion Labor Advocate news blog I always post climate and environmental articles at the top. Unlike some positive achievements on union and “resistance” fronts such stories are almost always grim. Much of the rise is attributed to energy hungry expanding Asian economies who use a lot of coal. A significant part of their growth is due to U.S. companies offshoring products that come back across the Pacific to the USA. Germany, with the third biggest economy, is proud of their use of renewable energy. But, as we have noted in past WIRs, they also continue to use a lot of very dirty lignite—so-called brown coal. And, along with all other major car-producing countries, Germany is a prime culprit in one of the five top reasons cited by the IEA for expanding emissions—the Sport Utility Vehicle. These heavy gas-guzzlers, loaded with distracting options like computer touch screens, are a growing share of the automotive market in North America, Europe, Australia and China. This month GM announced they are investing 265 million dollars in their Fairfax plant in Kansas City, Kansas to build the new “entry level” Cadillac XT4 “crossover” SUV. Across the state line Ford’s Claycomo plant assembles the F-150 pickup truck that continues to be the best-selling vehicle in the American market and one of the top globally. In Orion Township, Michigan, General Motors also builds an award-winning, modestly priced all-electric car, the Chevrolet Bolt. But with little promotion they sold only 25,000 of these near-zero emission four-door hatchbacks last year. GM had been an early pioneer in plug in electrics with the beloved but ill-fated EV1, leased in California from 1996-99. The corporate brass saw them as a threat to their highly profitable gasoline cars and trucks. As leases expired they confiscated and destroyed all of them. It remains to be seen if the Bolt and other EVs can prosper. Meanwhile, Trump’s EPA is working to roll back the very modest tail pipe emission and fuel consumption limits established by the Obama administration. Trump dismisses them as an unnecessary burden on industry and claims it will help consumers by lowering prices for–SUVs, trucks and vans. * Within a period of about a month, ferocious Hurricanes Harvey, Irma, and Maria spread devastation in Texas, Florida, Cuba and Puerto Rico. * California experienced some of about everything–drought, heat waves, massive wild fires, floods, and mud slides. * Torrential rains led to major floods in Europe including Paris where precautionary sandbags were staged around the Louvre. * The U.S. east coast typically sees one or two powerful winter storms known as nor’easters. Recently they had four within three weeks. * A severe drought threatening crops and livestock runs from the Texas panhandle across the state of Kansas. And if you are fond of Tabasco Sauce you might want to stock up. The single source of the spicy condiment is a small factory on Avery Island off the Louisiana coast that has been operated for 150 years by seven generations of the same family. The island is actually a dome of salt that will inescapably succumb to numerous threats including losing protective marshes that are a casualty of oil and gas wells, and warm Gulf waters rising faster than anywhere else. It’s already too late to save the pepper grown only on Avery’s salt dome that gives Tabasco its unique picante. But with prompt, rapid reduction of emissions we may yet save civilization. First, instead of just reacting to Trump’s crises du jour working class and social movements need to set our own agenda—with climate at the top. It is one fight we cannot afford to lose. Trump is a problem—but only part of the challenge. Trump is a bumbling bully—Obama was a slick con artist. It’s hard to say which is the most dangerous and such comparisons of the ruling class politicians going through the two-party revolving doors don’t mean much as our planet grows hotter. Unfortunately, even the dedicated climate action movement has joined with most feminists, civil rights champions, immigrant defenders, LGBT activists, single-payer advocates, 18 year old first time voters justly concerned about guns—and, of course, our unions—going all in for the Democrats in the midterm elections. Different flies—same capitalist excrement. You can’t win a war without distinguishing who’s friend, foe, or ally. Capitalism is responsible for all of the concerns of the movements I enumerated. None will be satisfactorily resolved by the ruling class Establishment. Above all, unity in action for class and climate justice is indispensable to saving the biosphere essential to human civilization. 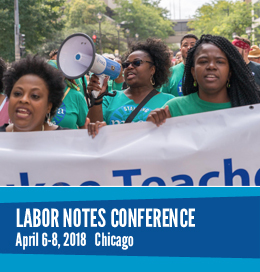 This time next week my wife Mary and I plan to be among more than 2,500 working class activists, many from dozens of other lands, at the Labor Notes Conference in Chicago. These biennial events are educational, not decision making. No votes are taken. But the presentations and discussion in the 200 plenaries and workshops available are almost always useful, often inspirational. One is devoted to Labor Organizing for Climate Change and several deal with various political questions. My next Week In Review will be devoted to a report on that conference.